Inaugural WORLD CLASS™ Yachting Cocktail Competition showcases crew members’ mixology skills. Bartenders from 20 of the world’s most luxurious yachts came together at the Antigua Charter Yacht Show last week to flaunt their mixology skills and creativity at the inaugural Diageo WORLD CLASS™ Yachting Cocktail Competition. St. Anne’s Point, built of stone upon a 200-year-old cannon platform, was the site of the competition, sponsored by Shore Solutions and the Crew Academy. With the sun setting off the island of Guadaloupe and gleaming superyachts snuggled along the docks of Falmouth Harbour below, Chief Stewardess Jasmine Rutter of S/Y_ Marie_ took out the ‘Yachting Bartender of the Year’ title. Taking part in a week-long series of innovative challenges, six crew made it to the final stage — a mystery box filled with ingredients. When Jasmine of S/Y Marie found fresh watermelon, coriander, black pepper, elderflower liqueur and Ketel One vodka, it was her “cool under pressure” that swayed the judges to award her with the Yachting Bartender of the Year title, not to mention the exquisite martini she created. With her new title, Jasmin will represent The Crew Academy at the Bartender of the Year finals in South Africa in September 2015. The global competition brings the finest bartenders together from up to 50 countries. Yachting, via the Antigua Charter Yacht Show and sponsored by Shore Solutions and The Crew Academy, is the newest ‘country’ to be added to the competition. ‘To have the superyacht industry in this competition now is incredible, and to be the first representative is a huge honour,’ says Jasmin. Chief Stewardess of the S/Y Vertigo Tracey Bamforth also competed in the WORLD CLASS™ Yachting Cocktail Competition. Wanting to stand out from the crowd when faced with the challenge of creating a drink based on a literary work, Bamforth avoided the traditional citrus and coconut flavours of the traditional ‘Caribbean’ style cocktail to create the ‘Dante’s Inferno’, a martini combining chocolate, smokey paprika, dried chilli flakes. Visually designed to represent the depth of the poem in colour with a bubbling mess of the layers of hell, the overall design of ‘Dante’s Inferno’ was projected to be the last drink on the aft deck of the yacht, under a starry night, cigar in hand. Unfortunately, Bamforth’s work schedule meant she was unable to continue through to the final rounds of the competition. According to Bamforth, cocktail making is an important skill for crewmembers to have considering the luxury market they work in. The competition also featured learning opportunities, and 20 from the luxury yachts nestled at Falmouth Harbour came to enhance their mixology skills through hands-on workshops hosted by Diageo Reserve WORLD CLASS™ ambassador Barrie Wilson, Reserve Brand ambassadors Paulo Figueiredo and Arturo Savage, and last year’s winner Charles Joly. 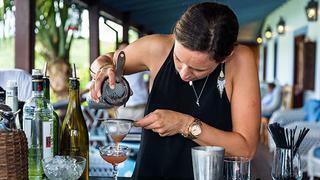 “The [competition] is about the craft of bartending,” says Joly. According to Joly, bartending is a real profession now and should be respected as much as the top chefs, but because the bartenders are front-of-house, they are judged on both their product and their personality.